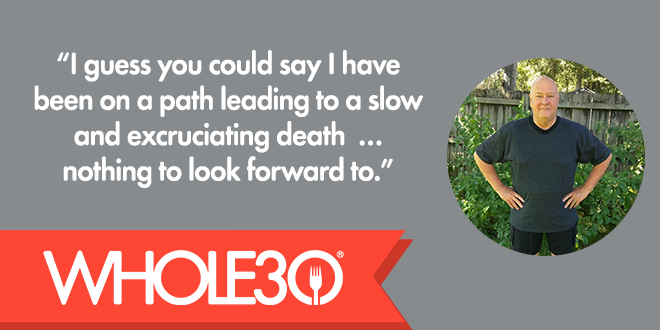 This post is part of our ongoing Whole30 success stories series. 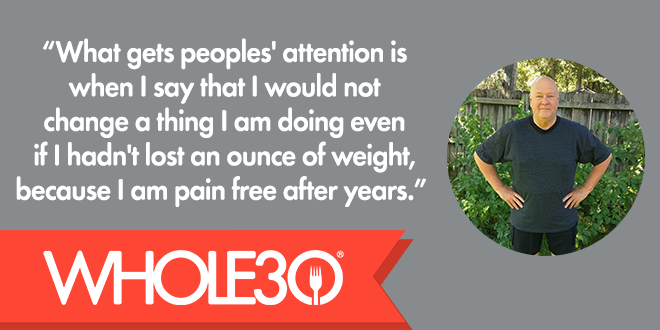 To submit your own Whole30 success story, contact [email protected]. 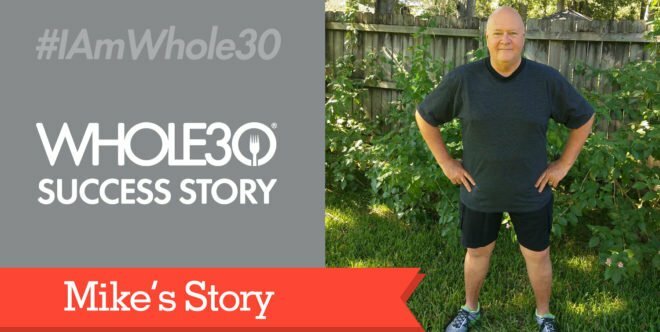 Today, we’re introducing you to Mike L. After experiencing incredible non-scale victories, reversing health conditions and losing weight on the Whole30, Mike was so convinced of the efficacy of the program that he turned his attention to spreading the word about our program to his community and health care providers. My name is Mike Lewis and I am 65 years old. For over 20 years I have lived with chronic back pain, obesity, high cholesterol, and I was declared pre-diabetic about two years ago. I lived on oxycodone for five years, taking three doses a day. I had five back procedures in a two-year period, each one involving spinal injections. I was diagnosed with seasonal asthma eight years ago and have kept an inhaler with me most of the time since that diagnosis. Yearly sinus infections have been my norm for as long as I can remember. I guess you could say I have been on a path leading to a slow and excruciating death … nothing to look forward to. This spring, I embarked on a new program. It is called the Whole30. A friend turned me on to this after reporting incredible health improvements in her entire family. I ordered the book from Amazon and quickly read it. My wife and I set a start date of May 8. When we started, my weight was 286 lbs. I couldn’t really exercise because of back pain, but I persevered. As I write this it is August 21, 2017, the day of the solar eclipse. Let me tell you what has happened to me. 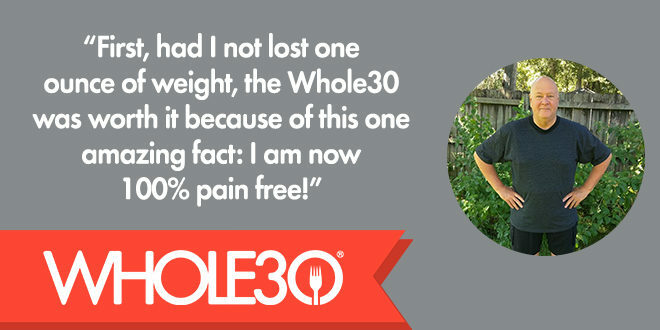 First, had I not lost one ounce of weight, the Whole30 was worth it because of this one amazing fact: I am now 100% pain free! I am jogging again—4 to 6 miles at a time! My stamina is off the charts. I actually get giddy with joy from time to time just experiencing life pain free. I had forgotten what that was like. I no longer have sinus issues and take no medicine for it. I haven’t had one single bout of asthma. My current weight is 250 lbs. and I continue to lose weight at a rate of 2 to 3 lbs. a week. (A healthy weight for me will be around 190 lbs.) When I started the Whole30 I was wearing a 48” waist size. I am currently in a 42” waist size. My goal is 34”. That may sound drastic, but there was a time over 40 years ago when I wore that waist size in pants. Let me tell you about my cardiologist. Back in April she was looking over the results of my bloodwork. She said that I had to go on statin drugs and that I was knocking on the door of full-blown diabetes with an A1C number of 6.8. Pretty much all of my numbers were dismal. At the time of that appointment, I had just received and had started reading The Whole30. I asked her to give me 3 months to improve my bloodwork with a lifestyle change. She agreed. I had new bloodwork done and saw my cardiologist 3 weeks ago. When she came into the exam room she exclaimed, “WHAT have you been doing? !” I told her about the Whole30. She wrote down the name of the book and said she was going to order it. Then she went over my numbers with me. I no longer need to be on statins. My cholesterol dropped from over 200 to 118. My A1C number is now 5.5. She was astounded with the changes. She ended our meeting by telling me that she had no advice for me except to keep doing what I’m doing. I assured her that I would. One of my clients, Dr. Gail Leterle, got really excited about what I was doing. He ordered The Whole30 and he and his wife tried the program. He has invited me to come and speak about my experience to his patients in nutrition/health seminars he is organizing. I asked him, why me and not him. He said that those patients would listen to me before they would listen to him. So I agreed. I have single-handedly been responsible for friends, clients, and medical professionals ordering your book. I am a zealot when it comes to the Whole30! What really gets peoples’ attention is when I tell them that I would not change a thing I am doing even if I hadn’t lost an ounce of weight, because I am pain free after years and years of agonizing back pain. That always gets their attention. You may be wondering why I waited until I was 65 years old to do something about my health. I’m not sure. I just know that as my 65th birthday approached, I had a meeting of minds so to speak. I dearly love my wife and I am ten years older than her. I realized that if I were going to be here for her, I had to make some changes. (She by the way, has lost 2 dress sizes and like me, continues to lose weight.) Our future is bright and filled with promise now. And we owe it to the Whole30. For us, it was a Godsend. Please note: This is Mikes’s experience, in his own words. The Whole30 is not a medical diagnostic tool, nor a replacement for working with a qualified healthcare practitioner. Speak with your doctor before beginning any new dietary or lifestyle program. Your results may vary.